She’s only 18 months but O has quite a personality. From her nonstop chatter and giggles to hand-on-hip attitude and waving her (already) jewelry wearing arms, she’s all girl. When we found out that we were having a girl we were thrilled. I daydreamed of sweet sundresses, hair bows, little bathing suits, baby dolls and more. There was one girl thing I wasn’t up for: nursery decor. I dreaded painting bubblegum pink walls… and worse- repainting over those in a few years when suddenly she loved lavender. Hubby agreed. After several trips to the paint chip wall at the home improvement store, we had settled on going with beige, greige or khaki tones. Boring? We know. But we had a few reasons. First, we had chosen to give O the largest of our bedrooms. 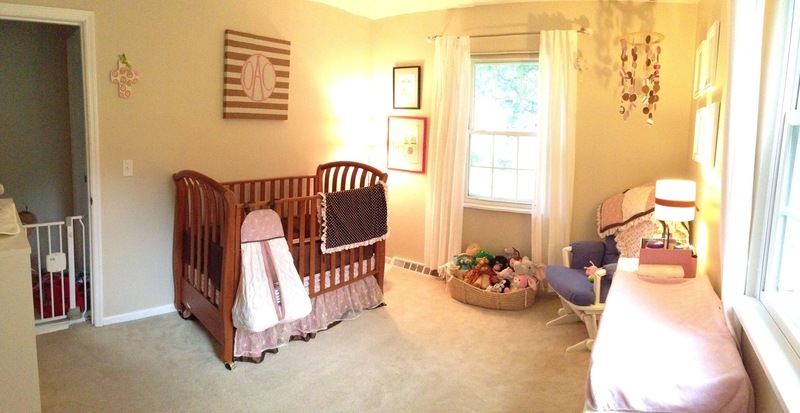 It was inevitable that we’d be spending a lot of time in the nursery, so why not the bigger room? And incase nobody tells you, kids come with a lot of stuff. 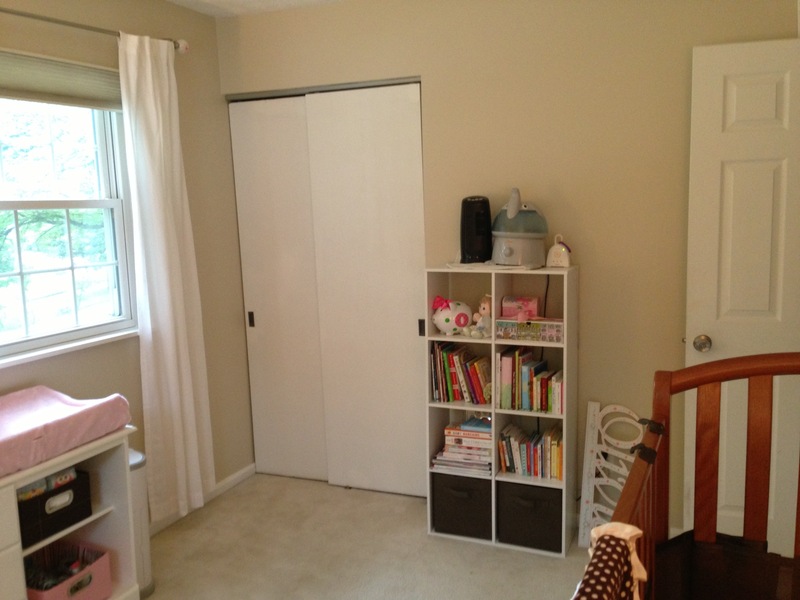 This room was largest and already had a well designed (and fairly modest size) closet. Also, most of our family lives in town so we host only a few overnight visitors a year. We could afford to have a smaller guest room. 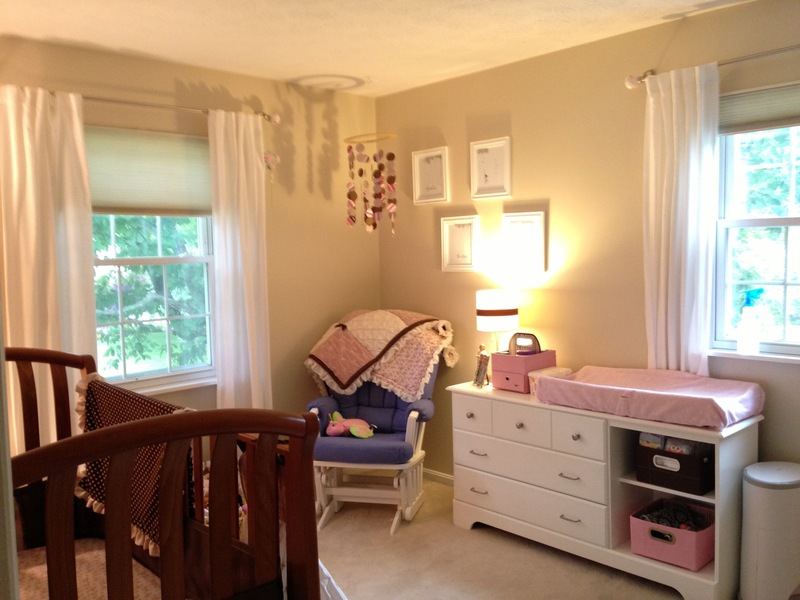 Second, we wanted to be able to switch O’s room to a boy theme later down the road if needed. We also knew that any of the soft beigy tones could easily lend itself to a big kid room, office or guest room if we decided to do any rearranging. The last reason is that we were painting over bright, gross sunflower pollen yellow. Said yellow was sloppily painted over a light purple color (we could see it through a bunch of spots on the walls). Beige would surely drown out all that nasty visual noise. Or at least thats what we told ourselves. The color we married was Behr Roman Plaster. Why do I say married? Because later on that same color graced the family room wall with stripes and then I took it all the way down our main hallway. Still in love. I’ve mentioned a tour of her room before… I recently had a few minutes to clean out O’s drawers, organize her books and do a basic clean up of her room. I snapped some shots because I know it won’t stay like this for long. This dresser. It is Hubby’s from his single days. I don’t have a before pic but imagine it DARK. You know, bachelorhood dark. And the cubbies on the right used to have an awkward cabinet door. I vetoed that when I doused it in high gloss white paint. I like the look of the baskets instead. And less places for little fingers to get pinched.I changed out the funky hardware for softer brushed nickel pulls and knobs. 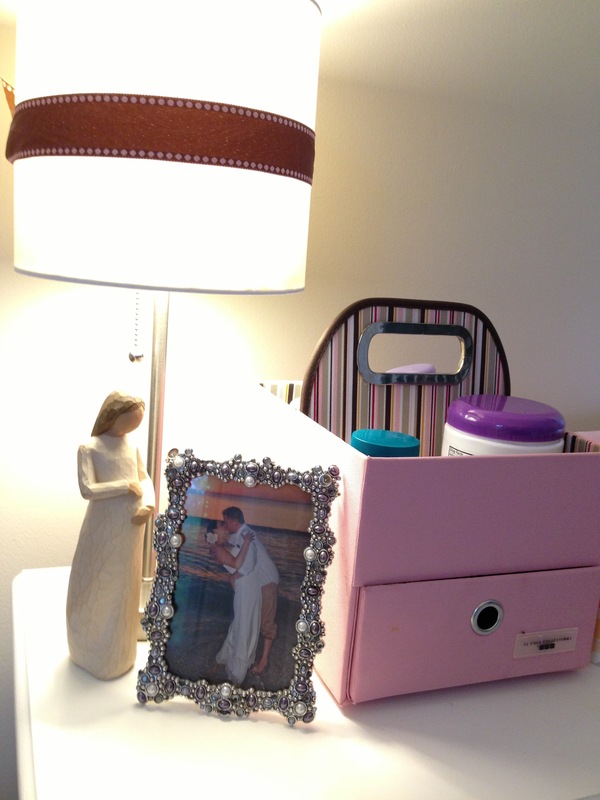 I added a couple of things to her dresser that were a little more about us. I was given the sculpture of the expectant mother by a dear friend of mine. I used to sit in the glider before she was born and just admire this space and the sculpture. So peaceful! Next to it is a photo from our wedding of Hubby and I kissing in the ocean. A little reminder of our love for O and each other. The lamp is wrapped in a cloth ribbon that happens to match the bedding set and theme. 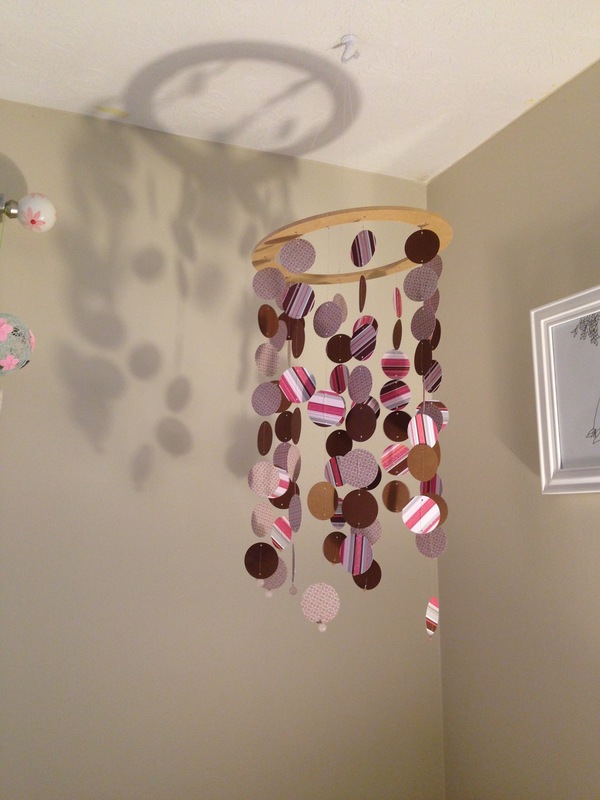 What is a baby room without some super sentimental handmade gifts? 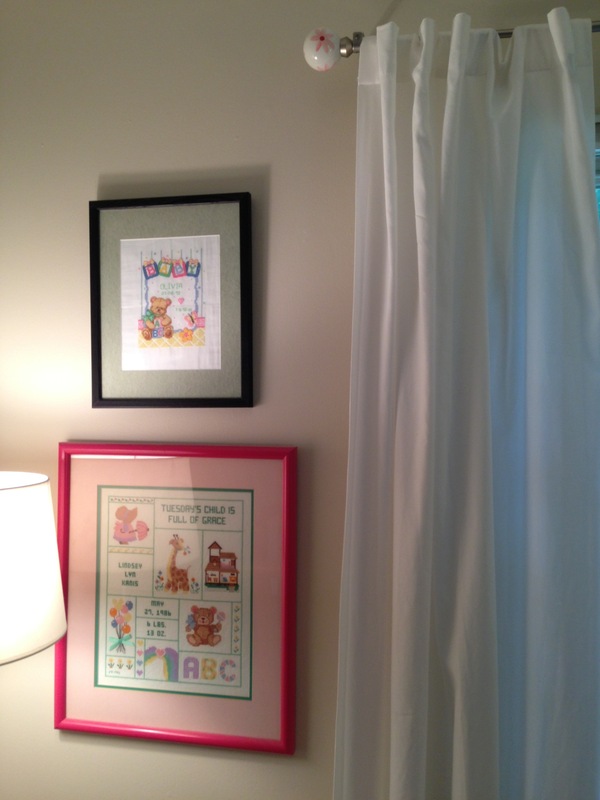 The pink frame holds a cross stitch that hung in my own nursery made by my Aunt Jackie in 1986. The frame above holds a similar baby cross stitch made for O by Mama Lisa (my friend Molly’s mom). 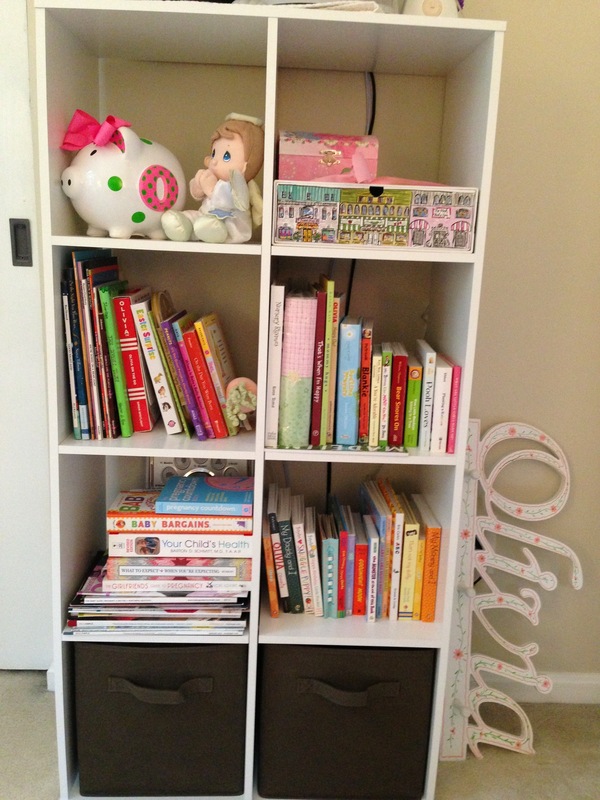 I have yet to hang her little coat rack but O’s bookshelf is stocked with books. My mom and sisters gave me gobs of children’s books at each shower. Some are favorites from my own childhood. A few are based on an Olivia the Pig character. I also received books from many friends. My boss gave me a book with girl poems, my friend Chelsea gave me a dozen of her own childhood favorites. My mom even found my old The Giving Tree book. A family friend gave it to me when I was a toddler. He’s no longer with us but I have his loving inscription forever “From one tree lover to another” he wrote. Which will explain my next picture. I chose to display pages from the book above O’s dresser. I tried to photo copy my favorite pages for framing but I ended up with low quality images and curved edges. I can’t believe I did this, but I bought a second hand copy of the book and cut pages out of it. I love books. I never dreamt I’d purposely destroy one. Cardinal sin!!! I hope this is worthy enough cause to cut pages from a book. 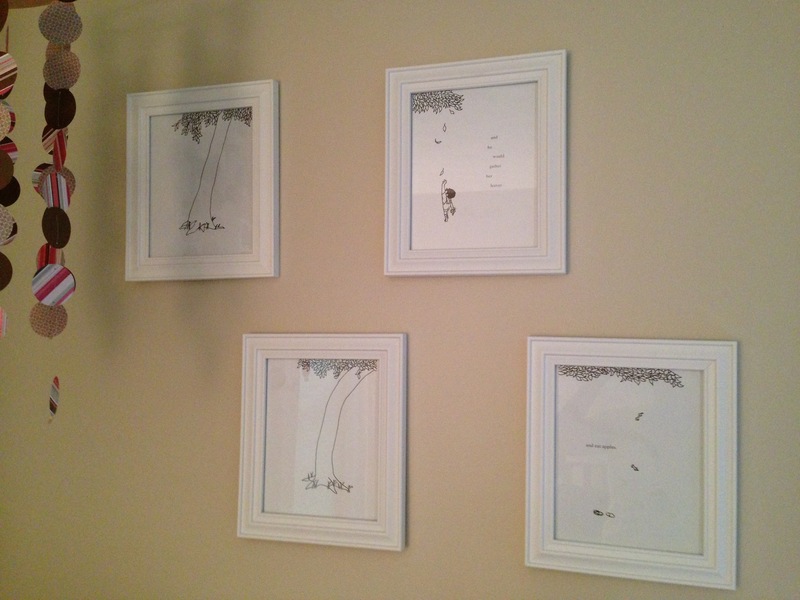 The message of The Giving Tree, the simple illustration and the sentimental value it holds for me made it the perfect choice for nursery wall art. My pride and joy: O’s mobile. I made it when she was just weeks old. I was inspired by many pinterest and etsy versions but I ended up making this myself for just $6. You can see the tutorial I made here. 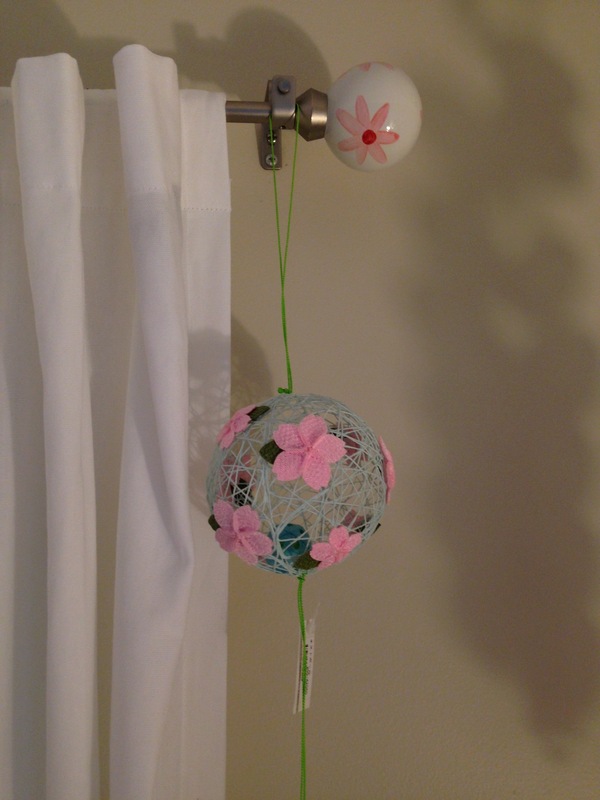 O received this small handmade globe rattle from some of Hubby’s Japanese business associates. You should know that Japanese culture is based on honor, family, loyalty and honesty. To show this, our Japanese friends arrive with arms full of gifts when they visit. We have gorgeous scarves, art, pottery, dishes, figures and more from them. I don’y know much about this particular piece but I know I love it. 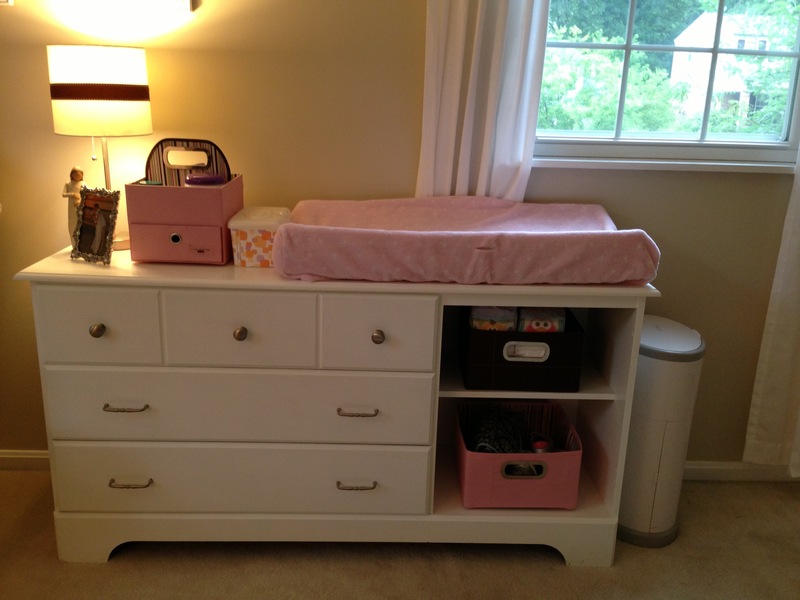 In fact, it is already the inspiration for O’s big girl room. 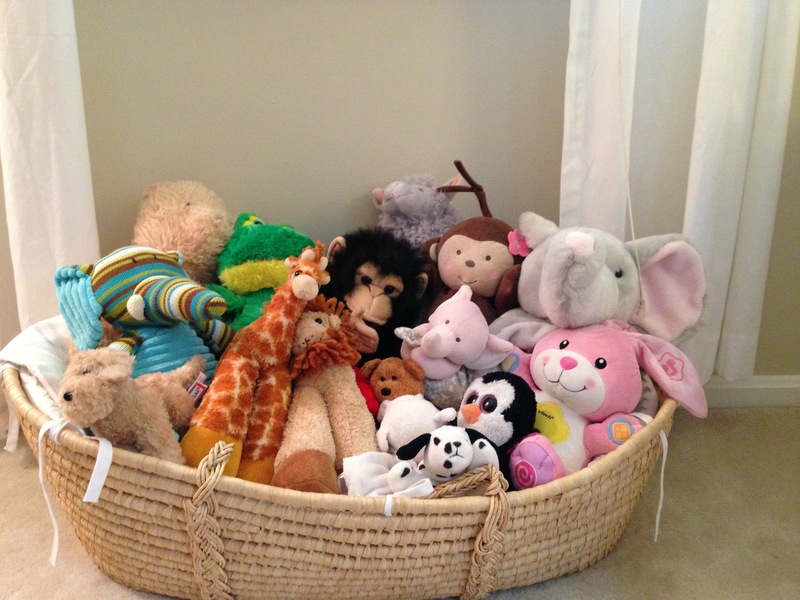 O’s extensive collection of stuffed animals lives in her bassinet. I felt like I just had to repurpose it since it was only used for a few months. 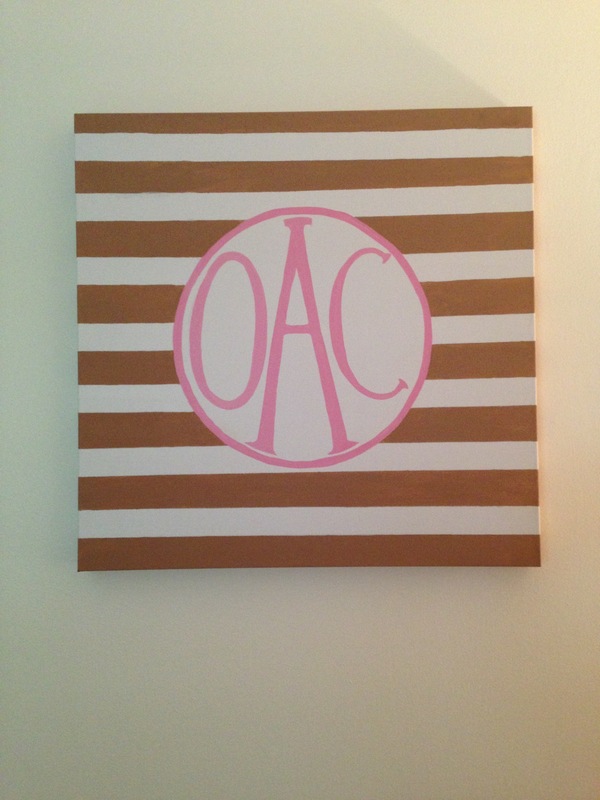 O’s monogrammed canvas is the latest addition to the room. I made it just this week. Look for a tutorial on it soon. Dresser: Hubby’s old one. Refinished. Glider: Hand-me-down. Which is why it’s blue/purple. Shelving: Target. This is the closest one I can find like it. I was too pregnant and tired to get my behind up to Ikea for the Expidit cube shelving unit. Picture frames: Target ages ago. Curtains: White Sail Cloth Curtains from Target. Elephant Humidifier: Target Crane Ultrasonic Cool Mist … quiet, easy to clean, safe and cute!